Atlanta, Ga. (April 4, 2019) – Lewis Brisbois is pleased to announced that Atlanta Partner Jonathan Goins has been appointed to Law360’s Intellectual Property Editorial Advisory Board. The purpose of the board is “to get feedback on Law360’s coverage and gain insight from experts in the field,” according to an article announcing the formation of the 2019 board. Mr. Goins is one of fifteen board members, all with extensive IP law backgrounds, who will help steer Law360’s IP coverage. As the announcement notes, Mr. Goins is AV-peer rated by Martindale-Hubbell, and has over fifteen years of experience litigating federal IP cases on a national level, involving trademarks, trade secrets, copyrights and right of publicity for a range of clients, from Fortune 500 companies to entrepreneurial start-ups. 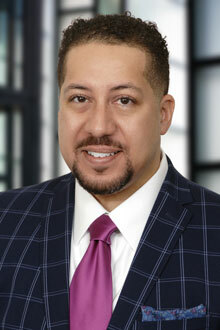 Mr. Goins is also an adjunct professor at John Marshall Law School and frequently lectures on IP law and related issues. He is also a frequent contributor to Lewis Brisbois’ IP & Technology Blog. Please join us in congratulating Mr. Goins on this recognition. Read Law360’s announcement here (subscription required).